Last year I had such a blast participating in the 31 Day Challenge during September, that there was no way I was going miss the group effort again this year. At it all starts in just two days time. 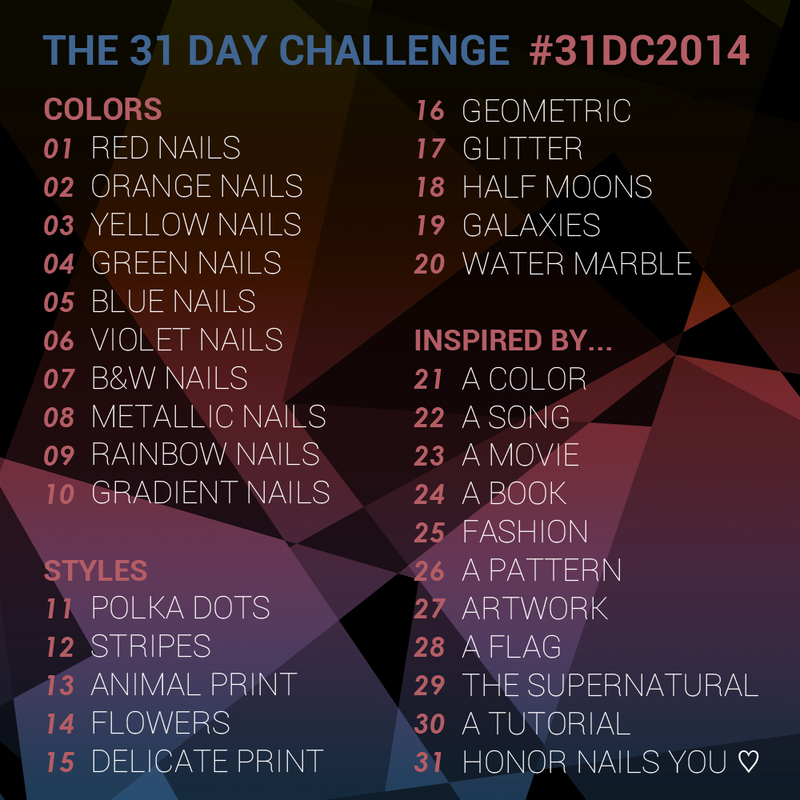 If you don't know what the 31 Day Challenge is all about, jump on over the Chalkboard Nails to read her FAQ and grab one of the challenge schedules. While there isn't an official inLinkz (everyone should use the tag #31DC2014), last year I set up a daily inLinkz for anyone that wanted to share their 31 Day Challenge work. The inLinkz tool has also been updated to be able to share your Instagram photos too. Once again I've set up inLinkz for every day of the challenge. I'll have each inlinkz in my daily blog posts, so if you want me to check out your nail art, make sure you add it to the list everyday. I hope at least as many people join in this year as there were last year, it was amazing, and Sarah has done a great job at getting us all involved together at the same time. Fantastic, make sure your link your post in the inlinkz so I can check them out. I'm really excited to do it this year :D I alllmost made it through last year (I got stuck after day 25) and this year I hope to make it all the way to the end without missing a day! You got so close last year, I'm looking foward to seeing your designs this year. I hope your joining in too, if so, use the inlinkz so I can check them out. Fantastic, the more the merrier. Make sure you use the inlinkz so I can check them out. I'll try to do it, hopefully it will work! I didn't paint my nails very much last month so I think I will be in the mood for some nail art! Thanks for the opportunity to share our nail art! That's really nice of you! This is my first year joining in, and I'm really excited. Thanks for setting up the InLinkz, I can't wait to see all the awesome nail art that comes out of this! I am attempting it again this year and I am so happy to find the InLinkz! Thanks for setting those up!